First up is the Rainbow Pour Painting pot that I did on a day when the humidity wasn't over 100˚F. That one day. Anyway, I didn't document every step because it was still hot out and I'm impatient. Also, the author of the post I saw did a good job with the step-by-step. 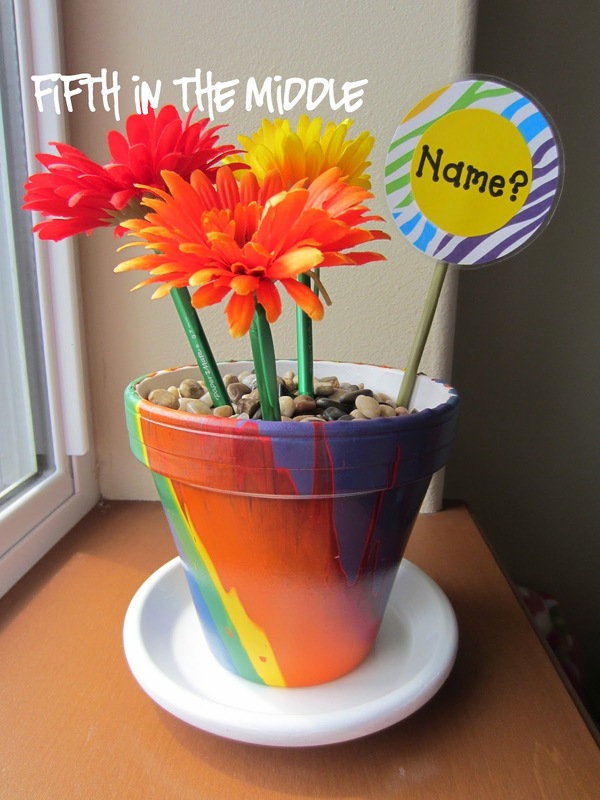 The first step after buying the clay pots and acrylic paint was to spray paint the inside and rim white. This is probably optional, especially if you hate spray paint like I do, but I wanted white to show instead of the clay in case the paint didn't drip all of the way down. This is the "after" picture, but you can see where the white shows through the paint. Then I inverted the pot onto a stack of plastic cups so that it was suspended over the cardboard. It resembled a lamp. This was so the paint that dripped off didn't pool on the rim and make it stick to the cardboard. Try to make it level. There was already a price tag over the hole in the bottom on my pots, but if yours isn't covered, you'll want to put some tape over the hole. This is where it might be helpful to check out the website I referenced for pictures. You start the painting process by making a small pool of paint on the bottom of the pot. After that oozes a little, you squeeze another color into the middle of the previous pool, and so on. My pot was concave on the bottom, so the paint had a hard time getting over the edge. To encourage the paint to go over, I slightly tipped the pots in all directions to get the paint going. The first few colors never made it over the edge, so I added more of those colors once the paint was oozing down the side. You don't need to use as much paint as you think. If you made big pools, then those colors dominate and cover up whatever came before. I found that the finished product was better if I used only a little paint and kept rotating through the colors. Personally, I didn't like how the orange and yellow looked, so if I were to do this again, I would only use dark or light colors together. Then you let it dry a long time. Like maybe a day or two, just to be safe. Then I remembered that I wanted to use one of the pots for an actual plant and I needed to expose the drain hole. So I took my craft knife and cut around the bottom and peeled off the inner circle of paint. This was the concave area that collected all of the paint anyway, so I was concerned that the area may not totally dry anyway. Problem solved! Then I remembered that since I wanted to put a plant in this one and I was going to use a saucer that I had spray painted white, the paint might do something funky if it was sitting in the drained water. So I used the Mod Podge acrylic sealer to spray it and make it shiny. I have no idea if that will help or not, or if it was even necessary, but I didn't want to take any chances. I don't like pens. They are too permanent and too "final." I don't like my students to use pens for any assignment, so I just don't like to have them available. The flower tape that I used to wrap a test pen was too sticky and bothered the heck out of me. The green colored pencil looked like a stem without the stickiness. So there you go. 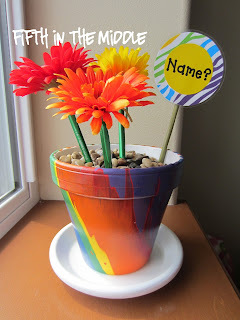 I used one of the stems from the flowers to make a little sign for the pot. And of course I laminated it! 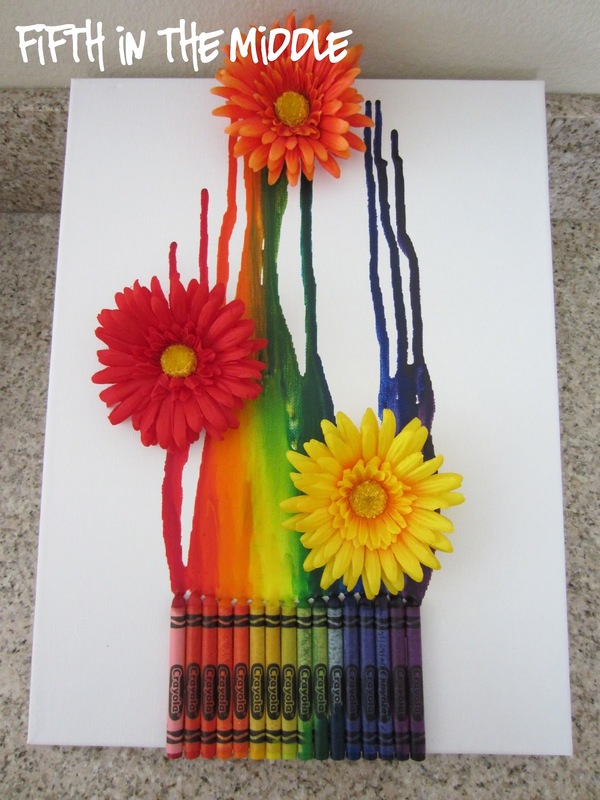 I had three flowers left from this project to use for my melted crayon art. My inspiration was here. These have been all over Pinterest in one form or another, but I like the addition of flowers. My daughter actually did one with flowers and then added a butterfly. Anyway, I followed the directions pretty much as written, but my canvas was 16" x 20" and I used most of a twenty-four pack of crayons. I do have a few tips, though. When I was hot-gluing the crayons on the canvas, I put the glue in the area between the crayons (in the empty triangle area if you are looking at it from the ends, not where the crayons touch) instead of under the crayons. This is because I wasn't working fast enough initially and the glue was already hardening before I could get the crayon on the canvas, so it was uneven and lumpy. If you are using a hair dryer, use the low setting. Otherwise, the wax will blow everywhere. Also, I noticed that the crayons started melting on the blunt end as well, so be careful! Lastly, if you glue on flowers, hot glue doesn't stick to melted wax, so you have to glue directly onto the canvas. I love your flower pencil idea. Using green mechanical pencils was so smart and probably saved you a ton of time compared to that gross green tape, haha. 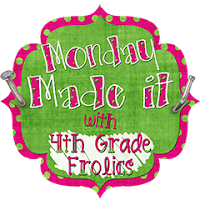 And I did think about making my own lesson plan book... maybe after my room is set up... I have a template that I made over the summer so it is real possibility!! Thank you for the suggestion!! 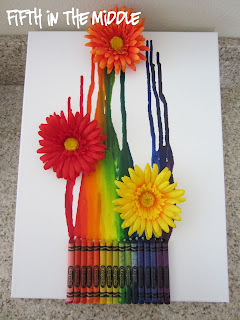 I LOVE your crayon art! I keep seeing it all over Pinterest but have yet to take that leap and give it a try!! It looks awesome though. You could make a cute crayon wreath (classroom door?) if you have any extra crayons! p.s. I am also "loving" the Olympics! Go team USA! I adore your pencil holder! It's a nice reminder for the students. If I had the patience for art I would so make one. 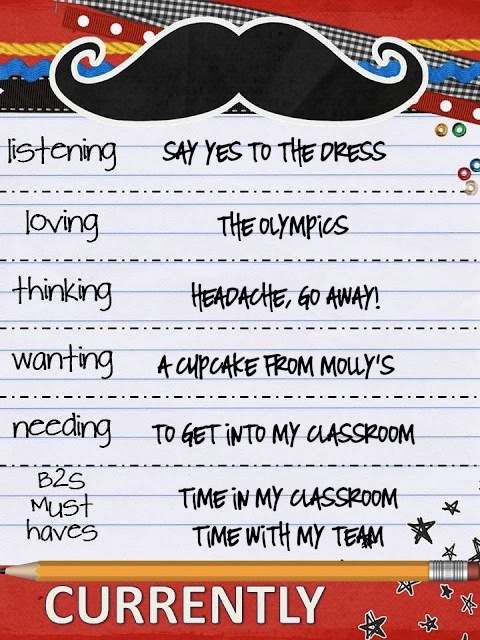 When will you be able to get into your classroom? Read your blog, and thanks for the HTML for the hyperlink! Been wondering how to do that! I like the rainbow pot, what a cool idea! Don't you just love Pinterest? Totally, but my to-do list is getting too long!